The most important area where eBay sellers drop the time-and-money ball is in shipping. If you’re not diligent, you can throw money out the window when you use incorrect packing materials; too often the wrong stuff is expensive in the first place, and increases the final weight of the package — and shipping cost. The packing materials that you use for your shipments can either make or break your bottom line in the Shipping Income/Expense column of your business reports. Prudent packing can be a boon to your business because having lower shipping costs can often make the difference between a profit and none (and offering free shipping affects your position in eBay’s search). This is especially true when several people have the same item up for sale, with a minuscule difference in the item’s selling price. Hint: Free shipping always wins. Packing is only expensive if you don’t know what you’re doing. You can ship your items in quality packing, keep buyers happy, and still make a dollar or so on each item for your handling fees. Buying your shipping materials online is trés economical. eBay shipping supply e-tailers make their living selling online. Their overhead is much lower than that of any retail outlet. Even after paying shipping to get the bubble wrap to your door, you save money and time. Most of these sellers ship the same day they get your order. Nope! Void fill is not a new drug to prevent hunger pangs when dieting. Void fill is the industry term for the stuff you use to fill up space in shipping boxes to keep items from rolling in transit. There are many forms of void fill, and the best kind depends on the item you’re shipping. Here are the most popular types, and a description of their plusses and minuses. Air packing pillows: These nifty little pillows seem to come in packages from all the major online stores. Consider storing them and recycling them in your outgoing packages. Buying air packing pillows from sellers on eBay is economical, mainly because the manufacturing and shipping costs are low. What these folks are essentially shipping you is 99 percent air. You can find air pillows in the Business and Industrial category. Some sellers sell the uninflated pillows with a small hand-size air pump to fill the pillows. Air packing pillows are perfect for filling in the area around smaller boxed items that you want to double box. They are also handy if you have breakables that you’ve prewrapped in bubble wrap; just use the pillows to fill out the box. They’re crushproof and can support about 150 pounds without a blowout. 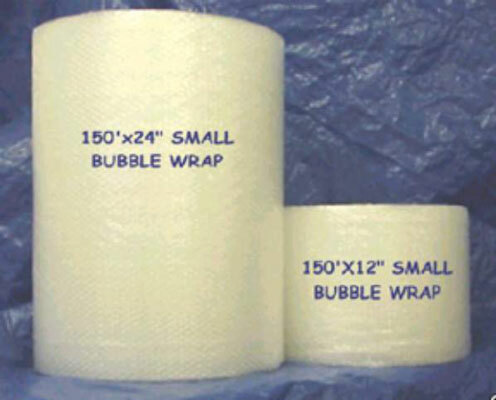 Bubble wrap: Made up of air-filled cushions of polyethylene, bubble wrap is supplied in rolls of different widths and lengths. It shines for those who wrap delicate, breakable items. When wrapping an item with bubble wrap, wrap it one way and then the other, and then affix some packing tape to make your item an impenetrable ball. Depending on your product, you may have to carry two sizes of bubble wrap to properly protect the goods. Bubble wrap is reasonably prices and adds next to no weight to your packages. When you purchase bubble wrap, be sure you buy the perforated, or tear-off, kind. Cutting a giant roll of bubble wrap with a box cutter can be a dangerous proposition. Plain old white newsprint: In the right shipping situation, plain white newsprint is fantastic. eBay sellers dealing in glass, china, and breakable knickknacks often use white newsprint to wrap each piece before placing it in a box full of packing peanuts. White newsprint is cheap and easy to store. The bad news? It’s heavy when you use too many sheets to wrap the product. If you feel you would like to use newsprint, buy it by the roll and use a table-mounted roll cutter to cut the exact size you need. This setup helps you to avoid using too much paper. Styrofoam packing peanuts: Every serious eBay seller has to have a stock of packing peanuts. When properly placed in a box, peanuts fill every nook and cranny and cushion your shipment to make it virtually indestructible. They’re handy for padding Tyvek envelopes and filling boxes so that items don’t shift around. A bonus: They’re cheap and if you recycle them, they don’t hurt the environment. When packing with peanuts, the key is to not go short in the land of plenty. Use enough peanuts to fill the box completely; leaving any airspace defeats the point of using the peanuts in the first place. Plastic bags: Buy plastic bags in bulk to save money. Make sure you buy various sizes and use them for both shipping and storing. Even large kitchen or trash bags are good for wrapping up posters and large items; the plastic protects the item from inclement weather by waterproofing the item. Two- or three-inch-wide shipping tape: You’ll need clear tape for securing packages and to place over address labels to protect them from scrapes and rain. Address labels can become soaked with rain and may be barely legible. Don’t risk a lost package for want of a few inches of tape. Hand-held tape dispenser: You need a way to get the tape off the roll and onto the box. Using a tape dispenser can be a bit tricky to the uninitiated, but once you get than hang of it, you’ll be sealing up boxes in no time flat.